Fr Doyle isn’t the only great spiritual hero who felt he had much lukewarmness to account for. 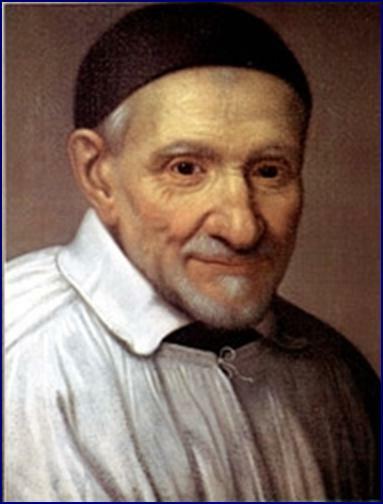 Today’s saint, Vincent de Paul, seems to have had very mixed motives during his early years. The desire to secure a prestigious ecclesiastical benefice and live in comfort seems to have been foremost in his mind when he was ordained a priest in his very early 20’s. In fact, he even had recourse to the courts to vindicate what he saw as his rights in the Church, and, so keen was he to protect his rights that he even chased a man who owed him money to Marseilles. It was on this expedition that he was kidnapped by Turkish pirates and sold as a slave. It is this experience, plus the importance of friendships like those with St Francis de Sales and Pierre de Berulle that gradually brought about his conversion. What type of anthropology lies behind Jansenism? There is a heightened sense of sin, sin which cannot be overcome, but only beaten into semi-containment. There is a division of humanity into the saved and the damned, with the majority being damned. There is a tendency to see the poor, the weak as being damned, or at the very least as being beyond the influence of grace. Victims are damned, abusers are damned. Grace is given so sparingly, by a God who is mean with both love and Grace, and man, he is made in the same niggardly image. God is not merciful and forgiving but full of anger and rage, swift to condemn, waiting to punish. The wounds of the Son are not salvific but condemnatory, both victims and abusers are left without hope, the hell of now is but a foretaste of the hell to come. It is in this image man is created. It is clear that everything Fr Doyle stood for was in marked opposition to the Jansenistic spirit. Fr Doyle had a great love of the poor and the weak and a burning, passionate love of Christ. He was always gentle with others, and wrote a booklet to combat the problem of scruples. He encouraged the notion of spiritual childhood and the reliance on God’s grace to overcome our faults. Yes the Church in Ireland, and indeed in much of the world, faces its fair share of problems today. But it also faced massive problems 350 years ago as well. Reform is always possible.